Is sporting terms the South West London district of Wimbledon was, for many years, associated with tennis, with the All-England championships meaning that for two weeks every summer the area is crowded with fans of the game. The exploits of Wimbledon Football Club didn’t really come to prominence outside the football world until F.A Cup giantkilling exploits in the 1970s, league entry in the 80s and, of course that famous Wembley win in 1988 brought them to a much wider audience. In fact the club had already been one of the top amateur clubs in the country for a number of years and had been in existence even before the turn of the 20th century. By 1889 there was already a team operating named Wimbledon Association who played their home games on Wimbledon Common. The former pupils of Old Central School in Camp Road decided to start their own team and Wimbledon Old Centrals were born. The new club’s first match was on November 2 1889 and the opponents were Westminster with WImbledon, wearing their navy blue kit, winning 1-0 in what was reported in the local press as ‘an exciting game’. The match was played at ‘Wimbledon Common, by Robin Hood Road. Right from the start Old Centrals were more than holding their own (although at this stage still only playing friendlies) and by year three the club had grown enough to field a reserve team. By season four – 1892-93 – the club were forced to move when the overseers of the Common declaried the ‘the ball was creating problems for passers-by in their carriages’. The shift was only to another part of the Common. In the same season they finally entered their first competition, the local Herald Cup. The first competitive match was played against Battersea Albion and proved a double disaster. Not only were the team firmly put in their place with a 4-0 beating, they also had their dressing room at the Fox and Hounds pub robbed by ‘a prowler of the thieving type’ who made off with money and players’ valuables. The cup loss was Old Centrals’ only defeat of the season but clearly improvement was needed if the club were to fulfil their ambitions of competing at a higher level. The 1893-94 season saw further progress. Wearing a new kit of chocolate and light blue, Old Casuals entered two cup competitions and secured a revenge win over Battersea Albion in the London Junior Cup whilst also gaining wins over Fulham, West Norwood and Clapham before elimination. The club also entered no fewer than three teams in the South London League although this foray lasted just a single season as the team found the extra travel too demanding. The 1895-96 season saw Wimbledon enter two leagues, and win both. Victory in the Clapham League was secured on the final day with a win over Tooting Church Institute and the Herald League was also won as they finished the season with 22 wins in 31 matches. The following season saw a change in kit with green and black adopted as the new colours and success on the pitch continued with the league double repeated whilst the team returned to cup action, reaching the semi-finals of the London Junior Cup before bowing out at the hands of Dulwich as Old Centrals clearly established themselves as a major force in local football. The club had continued success through the remainder of the 1890s and as the calendar moved into the 1900s they made their first cup final. The 1900 London Junior Cup Final saw Old Centrals again take on Dulwich Hamlet who denied them their first major cup win with a 3-1 victory. The club were well-run and made healthy profits each season which allowed them to continue making improvements to the ground which was often praised by opposing teams and officials. 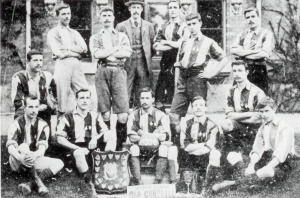 The 1900-01 season saw the club record a major treble with wins in the Clapham League, South Western Cup and Herald Cup and Old Centrals made a big, and inevitable given their success, decision. It was time to step up from junior football and start competing at the senior level. For the new level of football it was decided that a new ground was needed and the club left Wimbledon Common, moving to a fenced-in ground at Worple Road. The first campaign at the new ground proved disappointing on the pitch with no trophies added but the club continued to move forward and voted to move up into the Southern Suburban League for the 1902-03 season. Understandably the step-up proved difficult at first and their debut season in the new league failed to produce a victory until January whilst there was also an early London Junior Cup exit at the hands of West Brixton. The club quickly decided that fresh talent was needed and 20 new arrivals preceded the 1903-04 season. A good London Junior Cup run was finally ended by Clapham (it was to be their last season in the competition as they decided to move up to Senior Cup level) and the Southern Suburban League went all the way to the final day and beyond. Old Centrals finished the season level on points with Summerstown. But a superior goal difference was irrelevant and the two teams played-off for the title. It was Summerstown who prevailed, winning 3-1, a result which saw Old Centrals complain strongly about the referee’s performance. The 1904-05 season proved a watershed one for the club. Competing in the highly-regarded South London Charity Cup, Old Centrals reached their first senior final and took on Nunhead at Herne Hill cycle track in April 1905. The teams were locked at 1-1 with just a few minutes remaining when Pat Drummond broke clear and grabbed a late winner securing Wimdledon’s first senior trophy. Within a month of the success Wimbledon Old Centrals were no more. At a meeting on May 1 1905 it was decided that the ‘Old Centrals’ part of the name be dropped and Wimbledon FC was born. The changes didn’t end there. A new kit of white shirts and blue shorts, a new league, the Mid Surrey and entry into the Amateur Cup also came about that year. The Mid Surrey League was duly won in their first season with the new name, as was the debut Amateur Cup match before Wimbledon were knocked out in the second round. The following season proved disappointing but was significant in that the club entered the FA Cup for the first time. But the extra competitions and increased travel involved were taking their toll on the club financially. Over the next two seasons the club changed colours again, to green and black, and left Worple Road, going walkabout in search of a new home. They played at Grand Drive, The Chase, Merton Hall Road, Burlington Road (where waterlogging caused half a season’s worth of games to be called off) and Malden Sports Ground all while performing poorly and losing money. During the 1909-10 season the club pleaded with the council for help in finding a pitch that could be roped off. The pleas fell on deaf ears and the council refused to help. So, on 3 September 1910 the club sadly announced that they would fold. 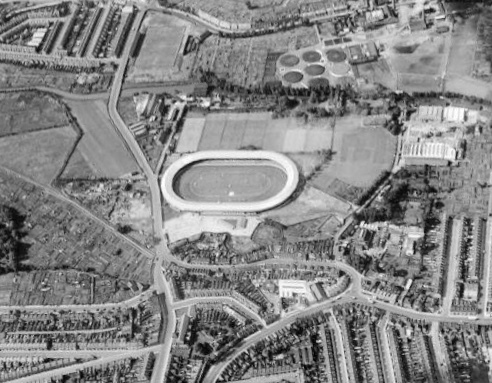 Almost immediately a new club, Wimbledon Borough FC, were formed, headed by the same people and even including some of the same players with an original home in Coppermill Lane where the Wimbledon Speedway and Greyhound trick was located. They soon dropped ‘Borough’ from the name and once again became Wimbledon FC. Then in 1912 a permanent home was finally found. It was on disused swampland on the corner of Plough Lane and Haydons Road, just 200 yards from the Speedway stadium. A lease was purchased with former co-owner of the land Mr Knight providing £50 towards improvements. During the first two seasons, as the club competed in the same competitions the previous incarnation had taken part in, the club relaid the pitch, fenced it off, added dressing rooms and built a covered stand with seating for 500. The first match at the new stadium was played on 7 September 1912, a friendly against Carshalton Athletic that resulted in a 2-2 draw. Although the club finished bottom of the table in the first year of their ‘rebirth’ there was genuine optimism that they were now in a good position to move forward. By the 1913-14 season Wimbledon had improved to finish a respectable 5th in the Southern Suburban League and looked well set to make continued progress when the country went to war bringing any further progress to an abrupt halt. Early in the war years Plough Lane was used for occasional benefit matches and the club continued with some minor ground improvements so that when football restarted Wimbledon were ready for it. As football was getting ready to restart Dons chairman Mr Gill Knight announced: “We have the finest ground in the southern district and have spent large sums erecting a stand and dressing rooms, and laying out and banking the ground at Plough Lane”. It was a fresh start, and the beginning of some real growth. Wimbledon competed in the United League in 1918-19 but the following season saw the club enter the Athenian League where they would compete for two seasons, the second of which saw them pipped for the title by St Albans. It was at this time that Wimbledon produced their first great player. In 1919 Stoke Newington-born George Armitage, who had been decorated during the war, attended trials that the club held. He was immediately signed up and given the centre-forward position before being moved back to centre-half. 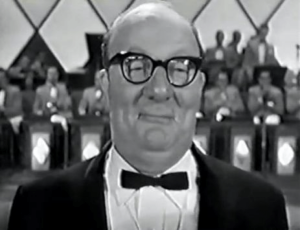 Armitage spent almost five years at Plough Lame and made around 150 appearances – where teammates included soon-to-be-famous bandleader (and great uncle of D.J. Fearne) Billy Cotton. He was also picked for the Amateur team that played the Professionals in the 1923 Charity Shield. Cotton also played for Brentford, was an accomplished Grand Prix racing driver and fled his own Gypsy Moth. His band became famous during the 1950s and 1960s and his television and radio shows gave many future singing stars their first break. Armitage then moved on to join Charlton Athletic where he would play for seven years winning an England cap – the first awarded to a former Wimbledon player – when he was picked for the match against Ireland in 1925. He also played five times for the England amateur team. The Armitage story has a tragic end. He had been discharged from the Army in 1919 after reportedly suffering from tuberculosis. After leaving Charlton he spent some time with Leyton before retiring. After he hung up his boots the tuberculosis returned and he suffered from depression. He had a stay in a sanitorium in Kent and on the day of his release, committed suicide by throwing himself in front of a train. Wimbledon’s stay in the Athenian League lasted just the two seasons as they and Wycombe Wanderers took advantage of the Isthmian League’s decision to increase in size from 20 to 22 teams. So, new era began and with a new Chairman; former incumbent Lt General Kent sadly passed away and was replaced by local MP Sir Joseph Hood. It certainly took the team some time to adjust to the more lofty opposition they met at Isthmian League level and the early 1920s was a period of few wins and the occasional re-election scare. But improvement off the pitch and in terms of facilities continued, especially in 1923 when chairman and chief benefactor Mr Gill Knight was behind the purchase of the South stand from Clapton Orient. Whilst there were few trophies on the playing side, Plough Lane itself was honoured again when the ground was chosen to host a trial match between England’s Amateur team and The Rest. Over 10,000 were at the ground to see England, with former Dons star George Armitage in the side, draw 1-1. 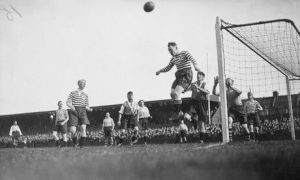 The mid-1920s saw form improve again as the team came close to taking the Isthmian League title in 1926-27, eventually finishing just a point away from the runners-up spot. The upsurge in form coincided with the arrival of Wimbledon’s next big star, centre-forward Doc Dowden. Dowden‘s debut was inauspicious, coming in a 6-0 defeat to a strong touring South African National side, but he was soon banging in the goals and becoming a fan favourite. He spent some time at Fulham although he remained as an amateur and continued to be employed by sports firm Spalding. 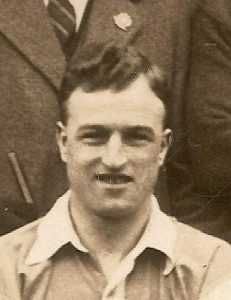 Dowden set an individual scoring record when netting six times in the 15-2 thrashing of Polytechnic in the 1929-30 FA Cup. He ended that season with 19 FA Cup goals and went on to lead the side throughout their first ‘glory period’. When he finally hung up his boots Dowden had compiled a remarkable tally of 283 goals in 311 games and he would later go on to spend ten years as first team coach between 1945 and 1955. The above-mentioned ‘Glory Years’ really got underway in 1929-30. After a few seasons of consistently finishing close to the top of the Isthmian League, ‘29-‘30 saw a 6th-place finish where playing a game-a-day for a week to catch up on fixtures lost to Cup runs saw them shoot up the table from a lowly position. Those Cup exploits saw progress to the 1st round proper of the FA Cup, including that 15-2 win over Polytechnic. The run was ended by a 4-1 defeat to Northfleet United who would be defeated in the following round by Clapton Orient. The Amateur Cup saw victories over the Metropolitan Police and Ilford among others and resulted in a semi-final at Portsmouth’s Fratton Park against Bournemouth Gasworks Athletic. A crowd of more than 6,000 saw the Dons fall 2-0 at the penultimate hurdle. The aforementioned Dowden hit a total of 50 goals during the season with 29 in Cup ties, his 19 in the FA Cup is a single-season record that still stands. So 1929-30 was a fine season, but the best was yet to come.. 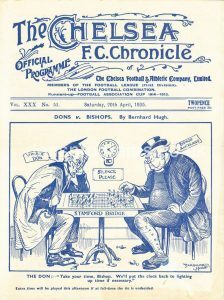 The 1930-31 campaign saw the Dons win the biggest title in their history when they captured the Isthmian League crown and the team also won the London Senior Cup, Surrey Combination Cup, Surrey Charity Shield, South Western Junior Cup and South London Charity Cup in a phenomenally successful campaign. There was also another run to the 1st Round proper of the FA Cup where the pros of Fulham proved too strong, although not until after a replay. A last-16 Amateur Cup elimination at the hands of eventual finalists Hayes was one of the few blemishes for a team admirably led by England amateur international F.H. Gregory in his last season before retiring. Success on the pitch clearly helped the club’s finances and they used the funds to finance more work on the ground and also on the construction of club offices at Plough Lane and 1931-32 saw another Isthmian title and another good FA Cup run where elimination came at the hands of Norwich City in the 1st Round. In the Amateur Cup, Wimbledon reached the quarter-final this time where a 2-2 home draw with Yorkshire Amateur resulted in a long trip north and a 5-2 defeat. Given what had happened during the previous two seasons, the 1932-33 campaign must have come as something of a shock. Second-from-bottom in the league, early elimination in the cups and a sudden financial crisis brought the Dons crashing back down to earth. It was clearly a transition time on the pitch and the national financial depression did little to help matters. By the following season the ship had been steadied. There was a rise back up to the upper reaches in the league (they eventually finished 3rd). Also, the visit of the HMS Victory team in the Amateur Cup 3rd round drew a record crowd of 18,000 to Plough Lane and they saw a comfortable 3-0 win for the Dons. They were eliminated at the last-16th stage by Barnet but it was clear that the woes of ‘32-‘33 had been put to bed. This set things up for a 1934-35 season that proved the best to date in the club’s history. The Isthmian League crown was captured again and a new high was reached in the FA Cup where the team reached the 2nd round, overcoming Leyton after a replay in the 1st. A home defeat to Southend United ended their hopes but in the Amateur Cup they went all the way to the final. Dons edged past Enfield 1-0 at Dulwich Hamlet in the semi-final to set up a meeting with Northern giants Bishop Auckland. The final saw a long trip to Ayresome Park and 20,000 fans saw the Dons under pressure but managing to hold out for a goalless draw. The replay drew 32,000 to Chelsea’s Stamford Bridge and despite Doc Dowden giving them a 3rd minute lead Wimbledon eventually went down 2-1. It wasn’t only the club that were in the limelight at this time. In 1935 Plough Lane was chosen to host the Amateur international between England and Wales, as further reward for the work continually being put in to keep it among the leading non-league grounds in the country. The banking around the ground had been improved and capacity now stood at 30,000. Another league title followed in 1935-36 although the cup exploits couldn’t be repeated and in the lead-up to the Second World War the Dons could manage only upper-mid-table positions with no progress in the two big knockout competitions. 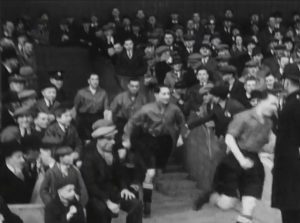 In 1939 the Isthmian League announced that it would be expanding by adding two new teams but no sooner had the season got underway than it was suspended at the outbreak of hostilities. The South-Eastern Combination competition was set up for those teams – including Wimbledon – who wished to continue playing and the club also won an emergency version of the Surrey Senior Cup, but football took second place to other matters for the next six seasons. In part two we’ll look at how Wmbledin continued to grow, eventually far beyond any dreams that might have been held by the men of Old Centrals.